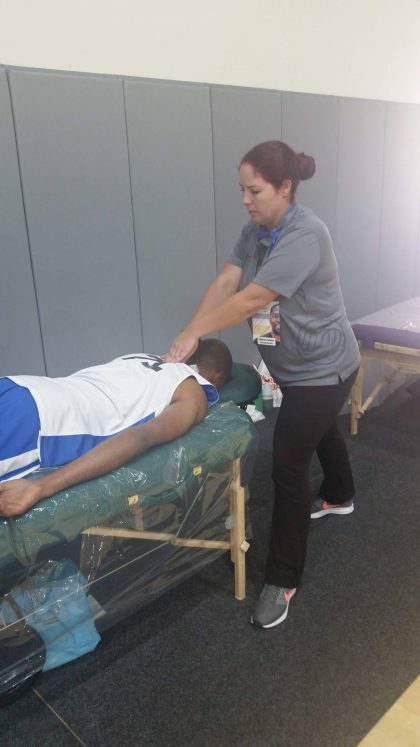 NHI Emeryville Massage Therapy Ambassadors (MTAs) teamed up once again with Pro-Camps to provide sports massage to the participants at the Kevin Durant Fantasy Basketball Experience from September 21st through 23rd . I am Kaela Petty and I am one of the MTA Coordinators on the NHI Emeryville campus and a huge sports fan. Since we participated last year I decided to reach out to the coordinator from the prior event to confirm if they would like us to return again as we all had such a great time and it is an awesome opportunity. So, we made it happen and also may have secured NHI to be the exclusive massage team for this event going forward. MTAs worked on the adult campers aged 35+ before and after basketball games where they were coached by former college and NBA coaches including former Warrior player Chris Mullin! I asked one of MTAs participating in the event, Shannon Fierros, to help document a day of her experience during the camp this year. 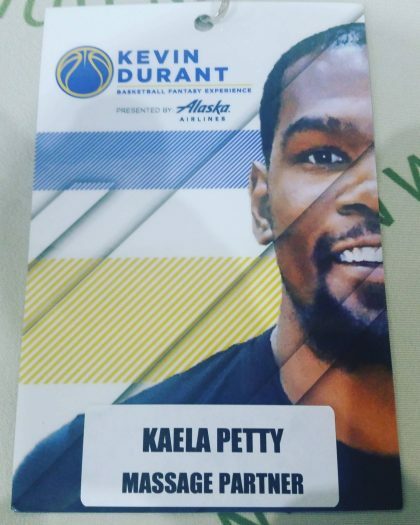 Being asked to work at the Kevin Durant Basketball Fantasy Experience the second year in a row was such a wonderful feeling! The first day I was really early to Oakland because I was so excited. Kaela, Vaughn and I set up with our tables and sign-up sheets, and were ready to go, watching everyone arrive and get to meet each other. We occasionally had a player or two come by to say hello from last year, or to get a quick stretch in before warming up. Generally, the first day tends to be slower at first for us therapists, the teams are getting settled and they do some announcements. We just get to watch everything happening on the court, enjoying the experience. This year, we had a surprise interaction with Kevin Durant himself! We were watching the teams play while sitting on our massage tables, and he came over to us to shake our hands and thank us for being there! It was definitely unexpected, but so awesome and genuine, I did my best to keep my “chill”. Day 2 was super busy from the time we walked in from the provided breakfast (8:00am) until the last game (4:00pm)! Those of us that were present the day before were still elated that KD came over to acknowledge us for our participation and thanked us for coming out with a hand shake (Man he is tall!). It was so exciting to see many of the players from the first event and having them remember us by name! They were super excited to see us there again and immediately begun signing in for stretching sessions and any other relief to their muscles we could provide. Day 2 is the longest day as they play several elimination games to get down to the final 2 teams for day 3’s finals! Us 5 MTAs rotated tables so no one got overwhelmed with clients and the day went very smooth. 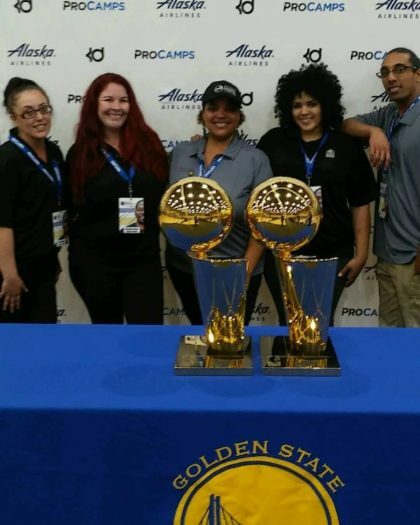 After we finished for the day we were able to take a group photo with “Larrys” the Golden State Warriors two NBA Championship trophies ! SO AWESOME!!! Finals day! Just like last year we were rooting for one team that had many of the returning players we knew, the oldest player being 70 years young! And guess what? They WON again! After the Finals, the players thanked us again for donating our time to ensure they were able to play their best game and let us know we were the real MVP’s of the event! MTA – Tara Winkler assisted one player who was injured on Day 1 and left limping and unsure if he could continue to play. With Tara’s help he was able to continue to play, all way into being named the MVP of the camp! How’s that for Having Work You Love?! He was the first one to thank us, and another returning client gave us snacks from Hawaii! We look forward to being a part of this awesome event again next time and continue to promote NHI and the awesome Massage Therapists that come out of this amazing College of Massage Therapy!